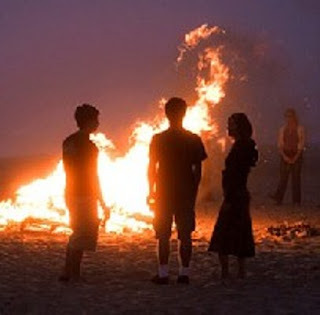 Imagine you are standing on a beach and there is a bonfire at the other end. If someone facing the fire were to walk between you and the fire, the amount of light you would be able to see would decrease; this is similar to the primary eclipse or transit of a planet across a star. If that person, still facing the fire, were then to walk around the fire so that they passed behind it. Just before they disappear behind the flames you will be able to see the fire and the face of the person due to the light that is reflected back. This is similar to what is called the secondary eclipse, when a planet passes behind a star. Now if this were all viewed with an infrared camera you would also be able to detect any thermal heat from the person just before they walked behind the fire. That may sound like a long winded analogy, but thus far it has proved to be the best way to try and explain what I do to the rest of my family. What I just describe was the Secondary eclipse which is on the opposite side of the orbit to the transit. It is the period where the planet passes behind the host star and its heated face is eclipsed. During the transit the night side hemisphere is being viewed as the planet proceeds through its orbit towards the secondary eclipse the dayside hemisphere becomes gradually more visible. Just before the secondary eclipse our view is almost entirely of the dayside hemisphere. The observed light is then a combination of the star light and light reflected by and energy generated within the planet. Secondary eclipse measurements have been made on binary systems for a long time but it was not until 2000 that David Charbonneau from Harvard University suggested that the technique be applied to exoplanets. It was, however, only put to use in 2002 by L. Jeremy Richardson and his team who observed the secondary eclipse of HD209458b using the VLT in Chile. Since then a number of secondary eclipse observations have been made of different exoplanets, but they total in the 10’s and the number of known exoplanets is entering into the 1000’s. Over the next few years, working in the Astrophysics group at Exeter University, using both ground and space based telescopes; I hope to make observations of the secondary eclipse of a number of exoplanets to reveal the dynamics of their atmospheres. What I also described in the beach fire analogy is something called tidal locking or gravitational locking. This is where two astronomical objects are always facing each other, like the person walking around the fire always facing inwards. There are a number of examples of tidal locking that can be seen in our own Solar System. The moon is tidally locked to the Earth which is why we only ever see one side of it; Jupiter’s five innermost moons are also tidally locked to Jupiter. A large number of known exoplanets are thought to be tidally locked to their star meaning one side of the planet is in constant sunlight while the other is in relative darkness. The darkside or nightside of the planet is viewed during the transit, while the secondary eclipse gives us a chance to measure the dayside of the planet. From observations of an exoplanets dayside, the temperature can be calculated. This can lead to information about the transport of heat from the dayside to the nightside and potentially the density of cloud structures in the atmosphere. The amount of light that is reflected by the atmosphere can also show us the chemical composition of the upper atmosphere as different elements have different reflective indices at different temperatures. The depth of the secondary eclipse, however, is very small (roughly 0.2%) making it very difficult to determine without a large number of measurements with high precision instruments. I hope that using both ground and space-based telescopes, I can contribute to the growing number of secondary eclipse observations and expand (if just in a small way) our knowledge of what it might be like on these planets and what it might mean for the evolution of our own solar system. OMG I think I understood that!